The weather turned nasty overnight. We had some serious thunder and lightning. I stayed up to watch the “fireworks”. It was funny to wake up in the morning and see the cows out our balcony completely unfazed. We had another slow morning enjoying coffee, muesli, yogurt, and cereal. After spending time in this apartment, I think we all agree that travelling with a kitchen and separate bedrooms is the way to go! 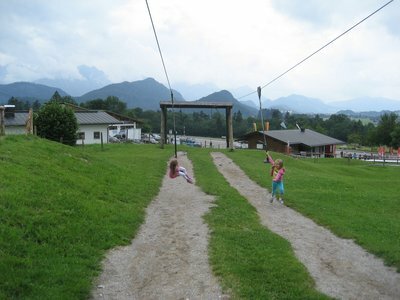 We took a chance in a rain-break and headed near the big castles to the luge track. The track was closed when we arrived but we bought tickets upon hearing they’d open in 30 minutes or so. There was a fun playground in which to pass the time. 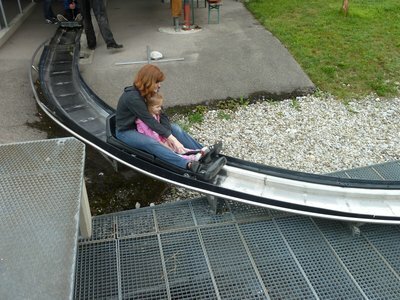 The luge was fantastic! Both DDs were speed demons and had no problem with me going full-throttle down the metal track. DH wasn’t as lucky on his run and got behind some slow-pokes. 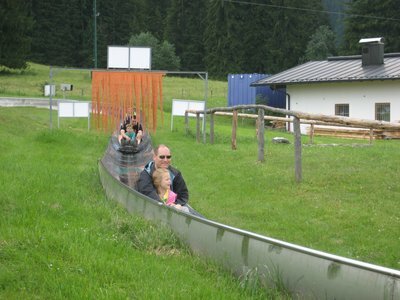 This particular luge track wasn’t as great as one we’d visited in Austria years ago. Still, it was an adventure and a good way to spend the morning. 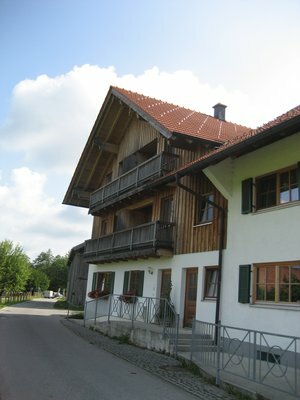 We headed to Reutte, Austria for lunch. 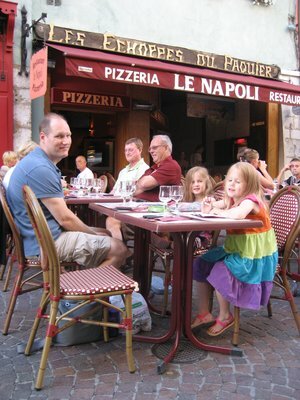 We found a recommended casual restaurant where we enjoyed fish, blintzes, and more croquettes! 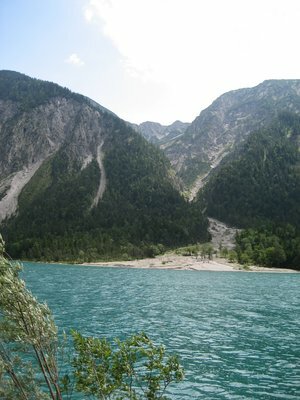 We took a long and scenic drive along Plansee Lake. Gorgeous! A ton of motorcycles were along this road. Soon the weather took a serious turn for the worse! There was serious side-ways rain and hail. 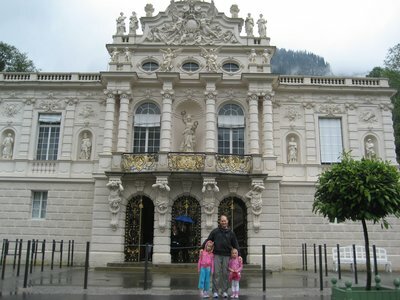 Still, we went to Linderhof Castle – the last of King Ludwig’s castles. 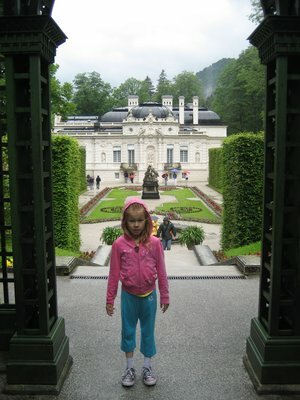 We hopped on a 20 minute English tour and really enjoyed the ornate and smaller palace. 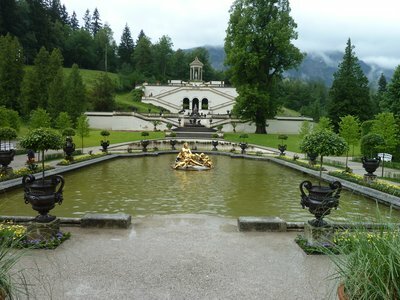 The grounds outside were amazing. It’s too bad we really couldn’t enjoy them completely in the pouring rain. We did our best! We stopped at a grocery store for dinner fixings for grilled sandwiches. 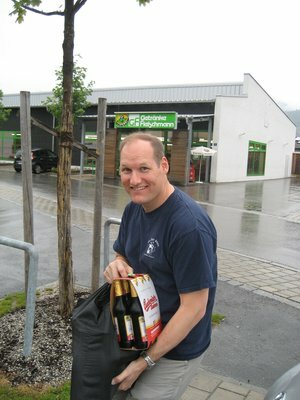 DH took a solo shopping tour in a Bavarian bottle shop. Sixteen bottles later…. It’s hard to stop yourself when surrounded by so many quality beers topping out around .79cents per bottle! We had a relaxing evening at home (drinking no where NEAR sixteen bottles) and enjoying the apartment for the last evening. Today’s entry is very short. 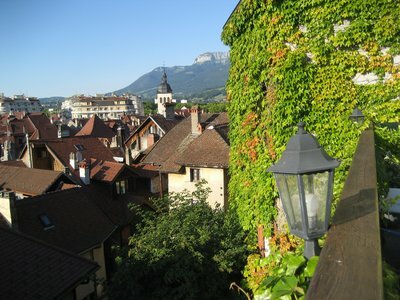 We left Steingaden around 10am and began our 6+ hour drive through Austria and Switzerland to Annecy. The drive was mostly uneventful. 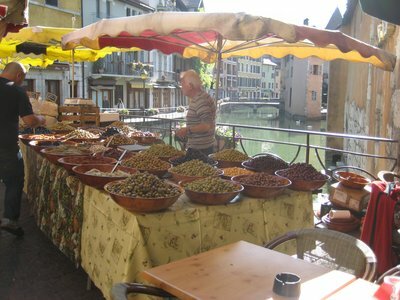 We fueled up in Austria (cheaper there) and bought some cherries – first of the year for us! 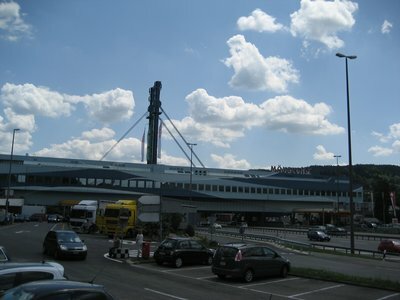 We hit nasty traffic near Zurich and were impressed by the many long tunnels. 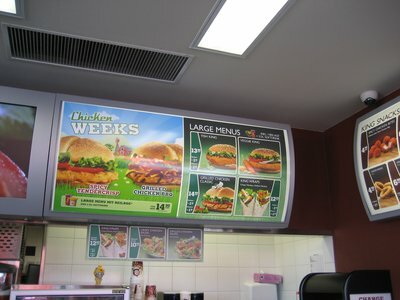 We stopped for a quick lunch at an auto-stop in Switzerland. The stop had a mini-mall over the freeway with crazy expensive prices! We opted for the Burger King. I lost my appetite when I saw the prices. 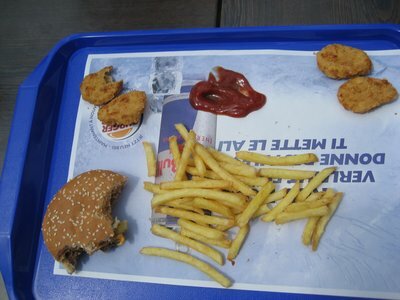 John had a cheeseburger and the kids shared one chicken nugget meal for around $15. Gulp! I was happy eating gummy bears, (can we say gummy tummy ache?) nuts, and cherries. 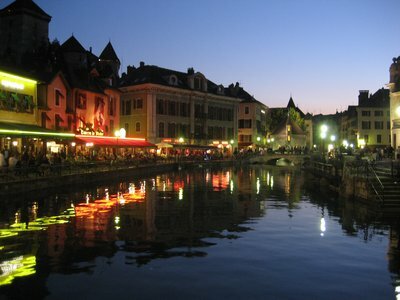 Finally after a couple nasty tantrums (I’m mostly speaking of the children), we arrived in Annecy! The drive to our hotel was sketchy because the parking was in a pedestrian-only area. Yikes! 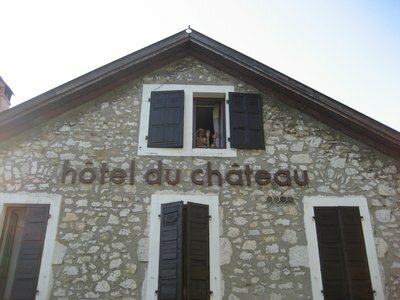 Even though we’re sharing a room again, the room is charming and we’re a one minute walk from the old town. 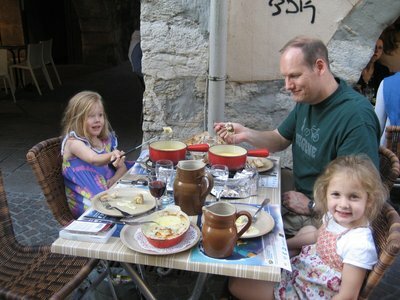 We rewarded our long drive with a typical Savoyard dinner – fondue! DH and I each ordered a different kind of fondue. Two massive cauldrons of melted cheese arrived at our table. 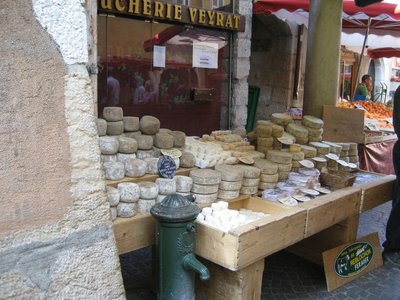 I don’t care if I ever see cheese again! The fondue was delicious and the kids thought it was a kick. 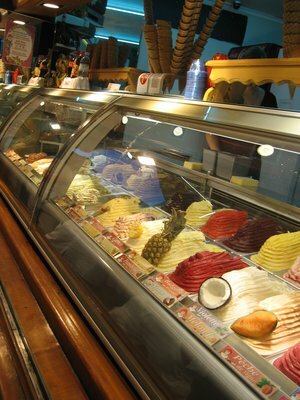 After a quick gelato stop for the kids (gelato is EVERYWHERE), we got the girls to sleep. 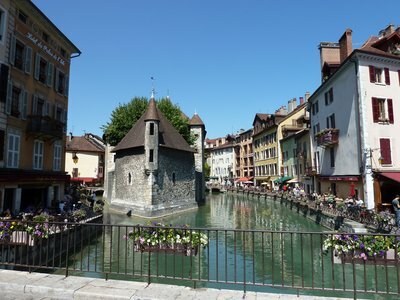 I was able to sneak out for an hour walk discovering the magic of Annecy. What a gorgeous town! It really came alive on a Saturday night. People were everywhere dancing, eating late, and wandering the streets. I even peeked into a couple of churches and was the only one in the whole place! It was a great walk after a long drive. Whew – what a day! We slept in until 8:30 or so. I quickly got up and went for a run. I was so excited to see that a huge market was just getting started! 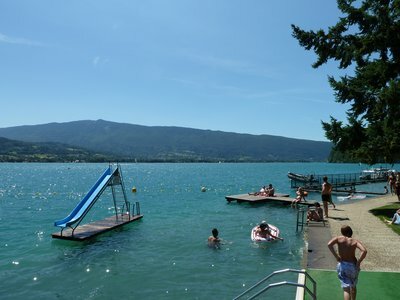 I ran part way around the lake and was excited for a our first full day in France complete with fantastic weather! 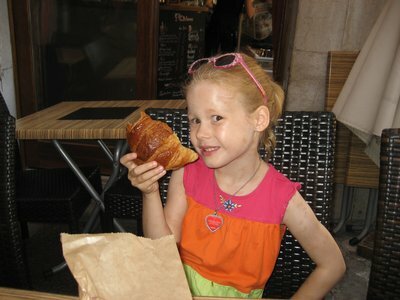 We wandered around the very busy market and bought delicious baked goods. We found a canal-side café for coffee. Mmmmm – perfect! The kids were in a good mood and all was well. Next we went by the lake and discovered that a big triathlon was taking place. 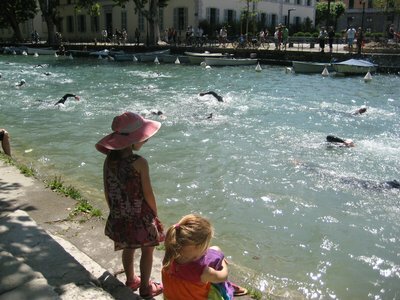 We watched the swimmers come off the lake and down the canal and hop on their bikes. The kids played at a couple playgrounds while we watched the crowds. 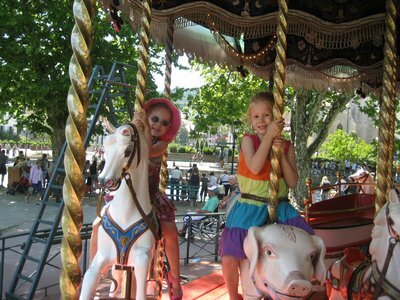 The kids rode the town carrousel too. After more walking, we grabbed a couple sandwiches and took them to our hotel outdoor seating area that overlooks the city. 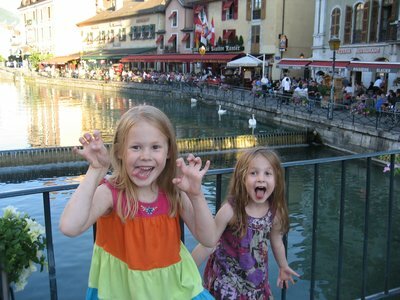 We then put on our swimsuits and took a drive part-way around the lake to a beach. The beaches were crazy busy today! 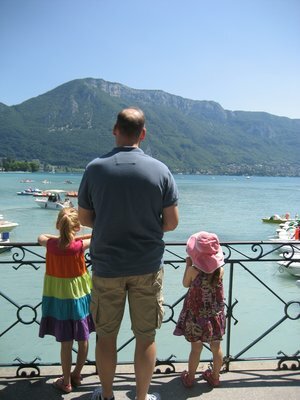 Still, we paid our entry fee (nothing is free) and swam in the lake. DD#1 and I went down the slide a few times right into the lake and swam out to a floating deck. The lake was cold but so clean. It felt great! DD#2 had more fun at a man-made kiddie wading pool. 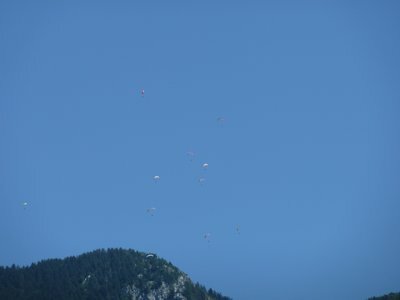 There was amazing number of para-gliders all over the sky. It was like a swarm! At one point, I counted nearly 50 of them. We returned to our hotel, regrouped and went out for dinner. After some walking, hitting a playground, a pharmacy (DD#1 has a little cold/cough), we found a pizza place for dinner. We were almost the first ones there because people eat so late around here! The pizza comes as an uncut disk – interesting. Food was good and filling and nice to be eating outside once again. 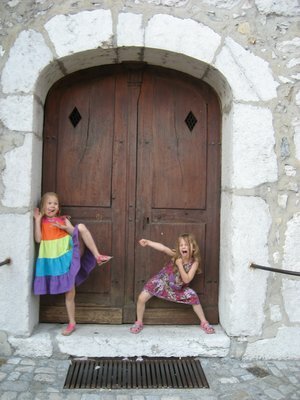 We made a quick gelato stop , had a few silly poses, and called it a day. Tomorrow - our incredible day at Chamonix. I'm a day behind. Happy 4th of July everyone!